Menus contain commands that you can use to create signs. Content Types not currently used by U-M because of various permissions, as well as how and where this menu populates content that is created. Network Overview/Network Tree lists networks, locations, individual sign player machines, individual sign layouts and more. 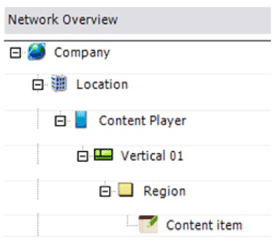 Right-clicking any item in the network tree will display an additional context menu with commands related to that item. Toolbar Buttons do the following: The first three buttons control what is displayed in the View pane. View Pane shows timeline view, sign preview, template layout (design) view, or network monitor view based on your selection in the toolbar. 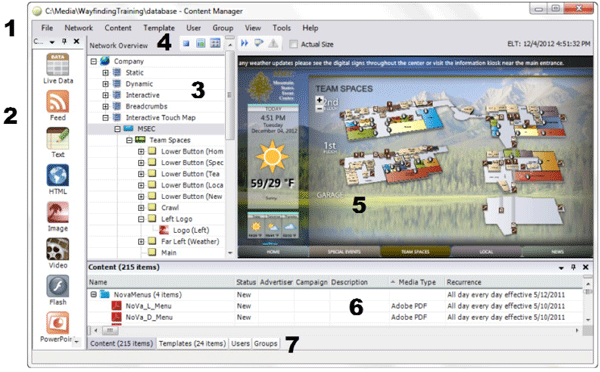 Content Library, list of available Templates or the list of Users or Groups are displayed in this area. You can drag and drop items from this area directly into the Network tree and "drop" them under compatible items there. Tabs at the bottom of the screen (Content, Templates, Users and Groups) control what displays in the area directly above the tabs. The Network Overview/Network Tree lists networks, locations, individual sign player machines, individual sign layouts and more. 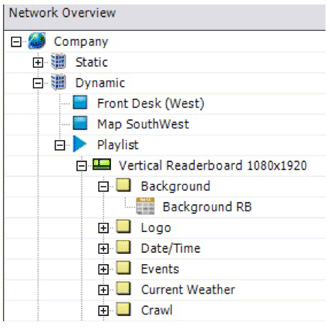 Right-clicking any item in the network tree will display an additional context menu with commands related to that item. Playlists provide a way to play the same template and content on multiple content players. They are automatically deployed when you deploy to any of the content players that are in the same location as, or in a sub-location of, the location that contains the playlist. 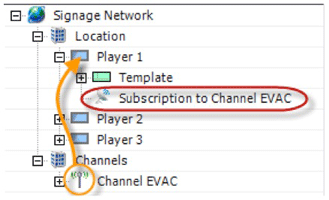 Any player in the network tree can subscribe to a channel, regardless of the player's location in the network. The channel will start and stop automatically based on the criteria set without any intervention from the user. It is possible to automate channel broadcasts based on external triggers (like the RSS feed from DPS). Channels are deployed to a network location, as opposed to being pushed directly to the individual player machines. The main requirement is that Content Manager and all of the subscribed player machines must have access to this location.